Mrs. G has been off in Atlanta doing her work thing for the past 8 days. On one of our last conversations, she asked if I would cook up some home cooked food for her return and who could blame her? I like eating out now and again just like everybody else. But 8 days in a row, three meals a day? That can get a little old quick. The only question was what to cook for her? When I think of home cooked meals, one of the first things that pops into my head is meatloaf. 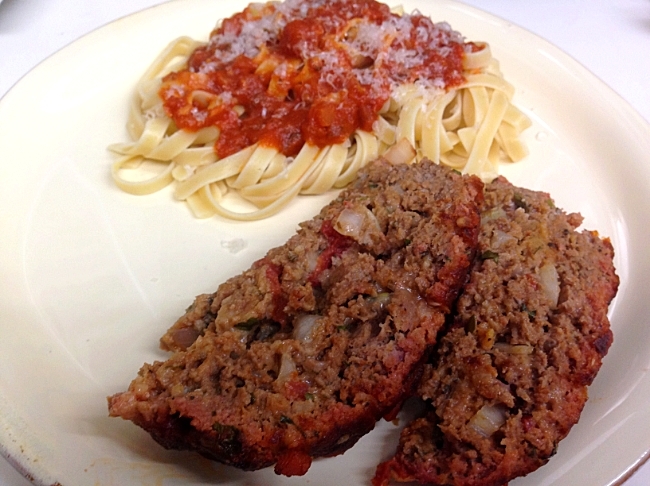 I’ve been wanting to take ordinary meatloaf and put a little bit of a spin on it for a while now and I figured this would be the perfect time to try my hand at making an Italian Meatloaf. I scoured the ole interweb looking for ideas, took a few from here and a few from there and came up with our own version. All the players into the bowl to be mixed up. Set up your grill for an indirect cook and preheat to 400. For how to set up your grill, see the section on Setting Up Your Grill at the bottom. If using an oven, preheat to 350. 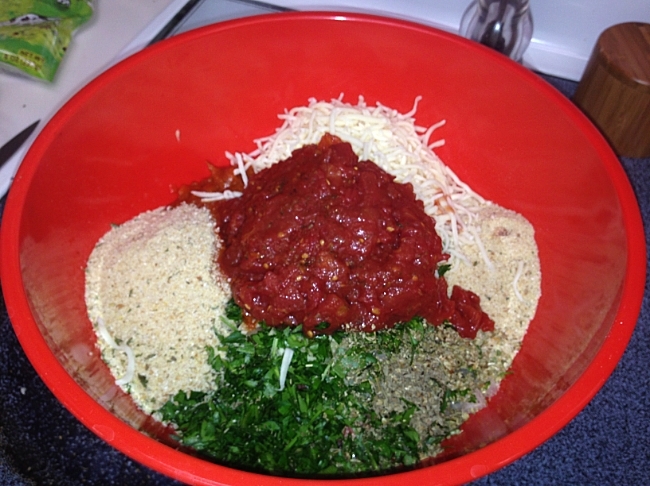 In a large bowl, combine all the ingredients and mix until uniform. Don’t overmix as it will make the meatloaf dry. Remove the meatloaf mixture from the bowl and handform into a loaf shape on the aluminum foil. Refrigerate for 30 minutes prior to cooking to help the loaf hold its shape. 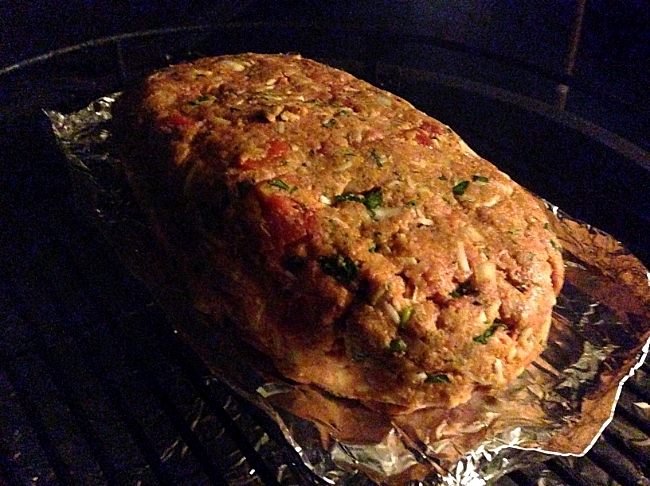 Place the meatloaf on the grill and cook until the internal temperature reaches 150 . If desired, add wood chips at this time per your grills instructions (We opted for orange wood just because I happened to find them at the store for the first time and wanted to give them a shot). Go easy on the wood, however, as ground beef will absorb the smoke like a sponge. 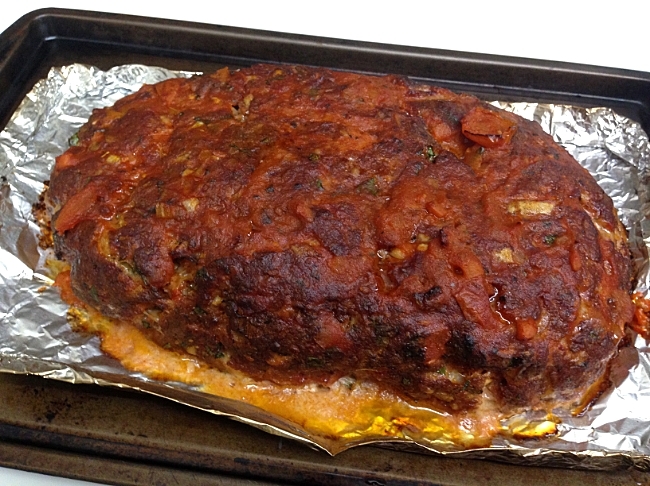 Once the meatloaf has reached 150, glaze the top with about 1/4 cup of the reserved marinara sauce and continue to cook. Once the meatloaf has reached 160, remove from the grill and allow it to rest for 5-10 minutes before slicing. Total cooking time should be around an hour to an hour and fifteen minutes, but remember, you want to cook to temp not time. Use the time as a rough guideline, but going by temp will ensure that you don’t end up with a dry, overcooked hunk o’ beef. Resting your meatloaf is just as important as resting a steak or brisket. Let it sit and cool off a bit and allow the aromas to perfume your house. Take a load off and enjoy a nice, refreshing glass of your beverage of choice or use this time to put the finishing touches on your side dishes. Plated up with a side of pasta. 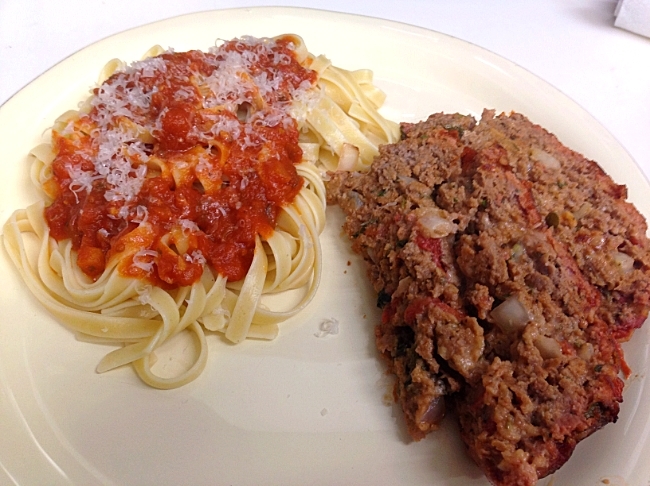 I was torn on whether to serve this meatloaf with the traditional side of mashed potatoes or go with pasta. I really wanted mashed potatoes, but offered the choice, Mrs. G choose pasta. No big shocker there, and since she had been out of town for over a week, we cooked some linguini we had laying around and used the last of the marinara sauce to top it off. I’ll just have to get my mashed potato fix later this week. For some reason, it never dawned on me until Mrs. G took a bite and said, “This tastes like one giant meatball! In meatloaf form!” I mulled over her statement for a few seconds and had to agree with her. It has all the ingredients you would typically find in a meatball, but in a loaf instead. I was really pleased with how it turned out. The flavor was phenomenal and the meatloaf was juicy, tender and moist. If I had the time and inclination, next time I might make my own marinara sauce to add into the meatloaf and to glaze the top at the end, but you will be pleased using a store bought version that you enjoy. Sometimes, you just have to take those short cuts in life. My set up on the Egg for this cook was to use the Adjustable Rig from The Ceramic Grill Store with the oval ceramic stone (wrapped in foil for easy cleanup) on the bottom level and the oval grid on the third level. If you do not have the AR, I recommend using the plate setter legs up (wrapped in foil for easy cleanup) and the original grate resting on top of that. For a charcoal grill, bank the coals on one side and cook the meat loaf indirectly on the other side with no coals. For a two burner gas grill, light the grill on one side and cook on the other unlit side. For three burner or more, light the outer burners and leave the center off. Cook the meatloaf in the center above the unlit burners. Go for it. Let me know what you think. If you do a post on it, though, please do give me credit. Thanks for checking out my site. It never occurred to me to cook meat loaf on the grill. I am going to have to give this a try. If I post about it, I will link back here. Thanks for the idea. You’ve got to try it, you will love it. Just go easy on the smoke. 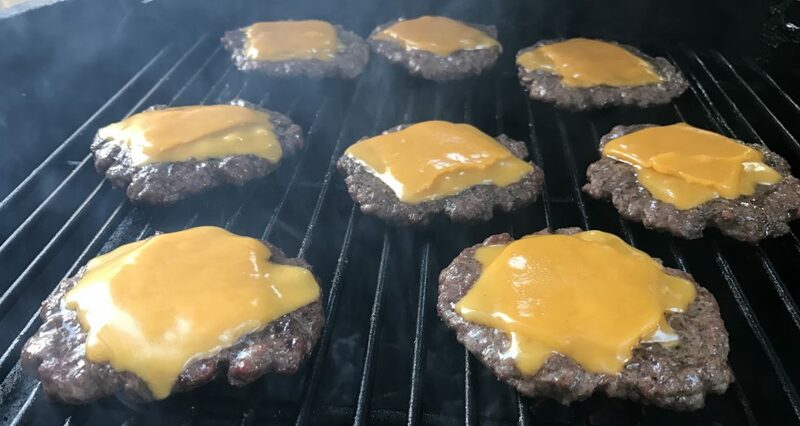 Ground beef absorbs smoke like a sponge. Let me know how it turns out.